Starting with a stock Chevrolet Silverado 1500 Crew Cab Four Wheel Drive pickup, we set out to see if the advertised gas mileage was achievable by the average driver. Next we accessorized with some of the most popular truck accessories for the Silverado to find out how these modifications affect the truck from the daily drivers point of view. Read on to see what we found as the accessories were added and the driving began. Chevy Silverado off road reports:Reviews from a two year test of the Chevy Silverado 1500 Crew Cab with the Z71 Off Road and All Star Package option from Chevrolet. This Imperial Blue Metallic Silverado with the 5.3 liter V-8, the 6L80E 6 Speed Auto transmission and Trailer Towing Package will be the foundation of our reviews. We will answer questions like, what is the Z-71 off road package and what tires will fit on the new Silverado trucks from Chevrolet. Information apply's to the 2007, 2008, 2009, 2010, 2011 and 2012 Silverado 1500. We will also be following the news releases concerning the purposed new redesign of the 2013 Chevy Silverado along with any developments from Chevy's Concept Trucks. Modifications to the 2011/2012 Chevy Silverado 1500. We install the Readylift Front End Leveling Kit, part number 66-3085, on the Chevy Silverado Z71 and than install the larger LT285/75/17E tires with no rubbing problems. We also added the Air Lift Air Springs to the back of our Chevy Silverado 1500 to keep it level under all loading conditions. Choosing the right gear ratio is not as simple as it use to be. With the new 6 speed transmissions having such low first gear ratios, the need for 4.56 and 4.11 gears may no longer be needed. See the gear ratio charts before choosing the ratios for your truck. The charts are adjusted for tire sizes and transmission options too so you can visualize the effects before and after the swap. Tires are typically one of the first places we go to add a little personalization to our trucks. Cooper tires are Made in America and designed by Americans for the type of driving we experience both on and off the roads. Cooper's continued commitment to excellence is evedent the moment you first drive on these premium tires. With special rubber compounds and the new ARMOR-TEK3 said to be 33% stronger in the sidewalls and 2.5 times more resistant to tearing. Cooper says the ST MAXX is a heavy duty all-terrain tire and lists them as 50% Road and Sand and 50% Dirt and Mud. Were about to find out how well these tires do in the frozen winter roads and trails of Alaska. Mounted on the Chevy Silverado, the new Cooper ST MAXX tires are about to embark on a winter trek across the frozen tundra in a place known simply as "The Last Frontier". The journey will surely be one to test the toughness and winter traction of the Cooper ST MAXX tires. 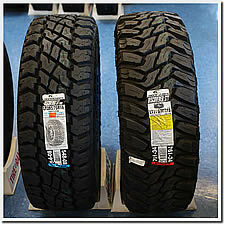 An Alaskan winter is in the future for this set of Cooper ST MAXX tires. 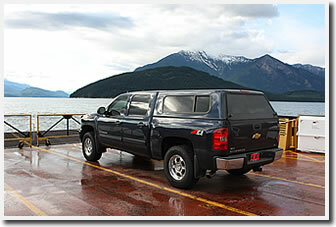 Information found on this site also pertains to the new 2013 Chevrolet Silverado 1500 Crew Cab 4-Wheel Drive pickups. Most all parts are interchangeable between these years. Find the Best Chevy Dealers like Dave Smith Motors in Kellogg Idaho offering the lowest prices on new Chevrolet Trucks with Internet specials and online inventories of new 2013 Chevy Silverado 1500 Crew Cab 4WD trucks. The new 2013 Silverado is yet to be released. Accessorizing the Chevy Silverado will be performed at Dave's Automotive in Cheney WA. Read along for a list of the current Off Road Accessories added to the truck. Gas mileage with the 2011 Chevy Silverado 1500 is impressive and very similar to all the other full-sized pickups on the market today. These are large serious trucks and in the past were not known as being very fuel-efficient vehicles for anything other than working, hauling or towing. But enter the 21st century, a time of high gas prices and tight household budgets. Today, the fuel mileage is as important as the comfort these new generation trucks deliver. And speaking about delivering, the new Chevy Silverado 1500 delivers on the need for a large tough truck that can haul the family boat while squeezing out the miles from every gallon of gas we buy. See, Chevy Silverado Fuel Mileage. Chevy Silverado 1500 Crew Cab Z71 Off Road Package 2011 &amp; 2014 Chevy Silverado 1500 Crew Cab with the Z71 Off Road and All Star Package option from Chevrolet. Reviews of the 2007, 2008, 2009, 2010, 2011 & 2012 Chevy Silverado 1500 Crew Cab with the Z71 Off Road and All Star Package option from Chevrolet. This Imperial Blue Metallic Chevy Silverado with the 5.3 liter V-8, the 6L80E 6 Speed Auto transmission and Trailer Towing Package will be the foundation of our reviews. We will answer questions like, what is the Z-71 off road package and what tires will fit on the new Chevy Silverado trucks from Chevrolet. Information applys to the 2007, 2008, 2009, 2010, 2011 and 2012 Silverado 1500.